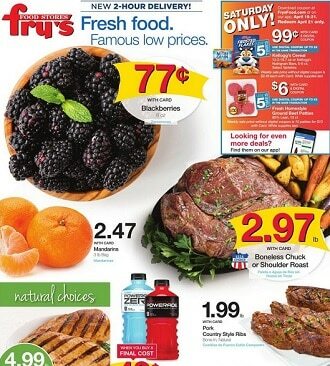 Check the latest Fry’s Food Ad, valid April 17 – April 23, 2019. Save with this week Fry’s Food Weekly Specials, digital coupons and Simple Truth organic deals. Great savings on Grade A Kroger Frozen Turkey, Tillamook Ice Cream, Red Seedless Grapes, Tyson Grilled & Ready Chicken Strips, Sabra Hummus, Tide Laundry Detergent, USDA Choice Beef T-Bone Steaks, Pedigree Dry Dog Food, Fresh Lettuce, Calbee Snapea Crisps, Freschetta Pizza, Yuban Coffee, Pantene Shampoo or Conditioner, Keurig Brewer, Las Palmas Enchilada Sauce.